Cooking at Café D: Weigh In: Do you Aerogarden? Weigh In: Do you Aerogarden? So, I'm thinking about getting an Aerogarden. Truly, I've been longing for one for a couple of years now. Surprisingly, I have a relatively green thumb. I still have the "Get Well" plant my sis sent me for having my tonsils removed. (In 1992.) And, I have still have a plant that a co-worker found dumped in the lunchroom trash. (Rescued that one in 2003.) And, my Mom's plants...survived her - so far by 10 years. Given that, I have resisted buying a "fancy-pants machine" to grow herbs. Every year I have at least a few pots of different varieties of spearmint. And, I just can't keep the herbage growing in the winter. I've been looking at buying a grow light. (And, hoping that the neighborhood cops don't get suspicious.) But, if I'm going to go through the trouble of setting up a grow light, I feel like I might at well just buy the Aerogarden. Afterall, those varieties of plants have been tested to grown under those specific conditions. Maybe I'm ready for a turn-key solution. I've been comparing the various sized machines over at the Aerogarden Store. And, while admiring the seed options, I noticed that they have a Full-sized Ruby Heirloom Tomato option. Hmm. Full-sized? So, I have some questions. Are you happy with your model? Do you wish you purchased a different model? Which herbs have you purchased? How has the growth been? How long have the herb pods lasted? How fresh did the herbs/veggies taste? Have you tried any "full-sized" veggies? Have you had to buy another bulb yet? Whether you are please with your Aerogarden or displeased, what should I know before buying one? Let's hear from you. I really can't stand paying $3 for a handful of limp pre-packaged herbs at the grocery store each time I want some fresh basil or chives. I'm inching closer to the Aerogarden each day. Should I full-sprint? 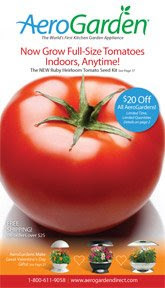 Meanwhile, I'll be reading the Aerogarden Chronicles over at Eat to Blog. 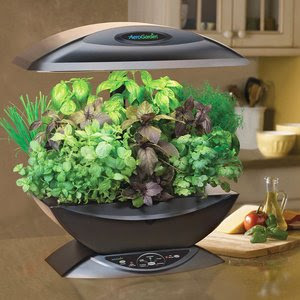 I don't have an Aerogarden, but I just wanted to make one comment on what I see as a potential drawback...I use a lot of herbs when I cook. A lot. I could wipe out that entire garden in one weekend. So production wise, it would never work for me. If it was 4 times bigger than it is, then I think it could keep up with my herb usage, but who wants a big honking Aergarden that is that big??? Just a thought. I hear ya, Lisa. Apparently, they come in different sizes - 3 pod, 6 and 7. So, you can get a smaller one to save on counterspace. And, I suppose if you wanted, you could choose to make all 3 the same herb. But, yeah, I guess I'd like to know if you ends it's little life cycle if you harvest all the leaves at once. You have a "relatively green thumb" ... and I have black digits. I've killed ivy. I'm so not kidding. My mother has orchids that she inherited from my grandparents. My sister has grown *ahem* plants from seed. My father has his vineyard. Then again, I have a coffee bean plant from '94. (I guess it thrives on neglect.) For herbage, I have the option of visiting my folks' gardens, and I do so frequently. Lisa makes a very good point - perhaps you should grow the "occasionally used" herbs (sage, chives) in your Aerogarden so ya' don't wipe it out with a cooking frenzy weekend.